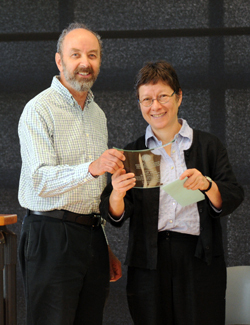 Economics professor Donald Wittman presents anthropology professor Anna Tsing with the Martin M. Chemers Award for Outstanding Research. 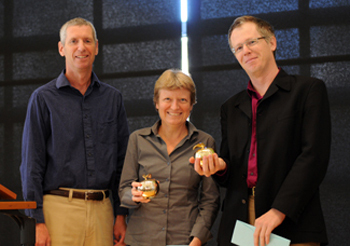 Francesca Guerra, center, a lecturer in sociology, and Andrew Mathews, assistant professor of anthropology, right, receive the Golden Apple award for distinguished teaching from economics professor Rob Fairlie. 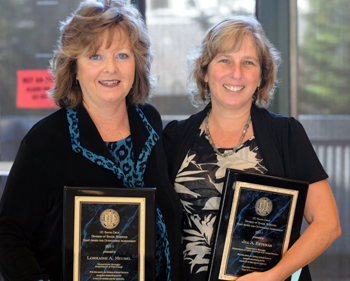 Department managers Lorraine Meusel of psychology, left, and Jill Esterás, of Latin American and Latino studies, won Outstanding Achievement Awards. Three teachers in the social sciences were honored for teaching and research last week as the division held its annual staff and faculty fall breakfast. Honored with "Golden Apple Distinguished Teaching Awards" Oct. 12 were Francesca Guerra, a lecturer in sociology, and Andrew Mathews, assistant professor of anthropology. Anthropology professor Anna Tsing was awarded the Martin M. Chemers Award for Outstanding Research. In presenting the award, Donald Wittman, professor of economics, incoming chair of the Community Studies Department,and last year's winner, described Tsing's research on the harvesting, transporting, and global ecology of the matsutake mushroom, a prized delicacy of the Japanese. In addition, Staff Outstanding Achievement Awards were bestowed on Jill Esterás, manager of the Latin American and Latino Studies Department, and Lorraine Meusel, manager of the Psychology Department. Graduate students Rajeswari Sengupta, in economics, and Dena Sexton Yee, in education, were named winners of the Milam-McGinty-Kaun Award for Excellence in Teaching, presented by economics professor David Kaun. Walsh Family Scholarship winners were Kiel Ireland, in politics, and Krissia Martinez, in legal studies. Jocelyn Bayne, a Latin American and Latino studies major from College Nine was named winner of the Weiss Family Scholarship.